A trip to Universal Orlando isn’t only for kids! 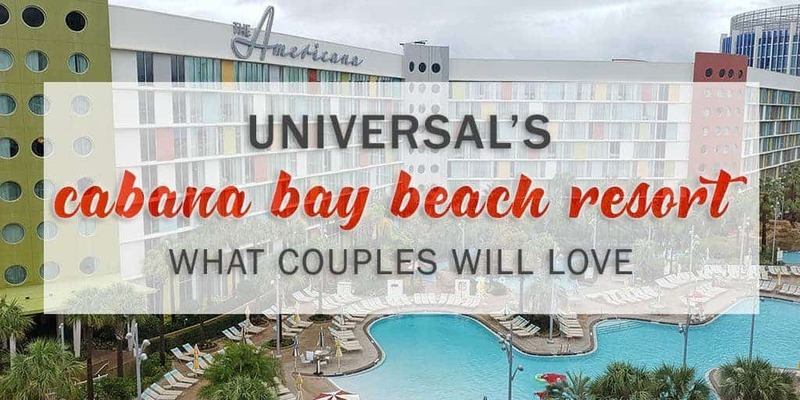 While a trip to Universal Orlando Resorts and its three theme parks is the perfect family vacation, it’s also a great getaway for couples without kids. Justin and I were beyond excited to visit The Wizarding World of Harry Potter in person, and an overnight stay at one of Universal’s resorts adds to the magic of the vacation. 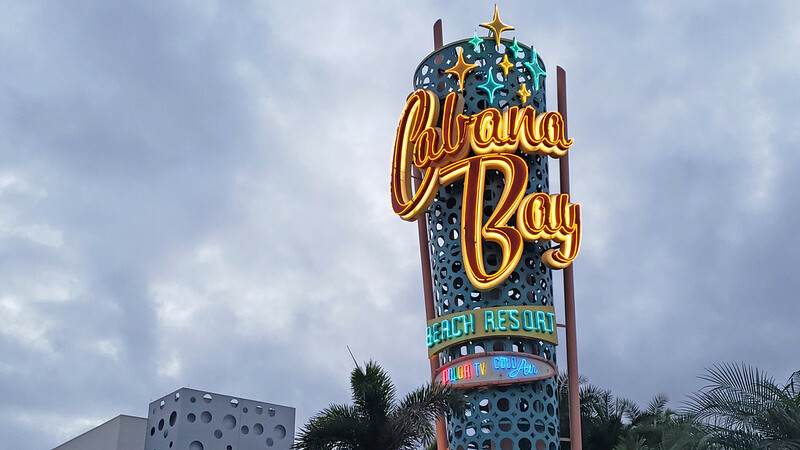 We decided to stay at the retro chic Cabana Bay Beach Resort. 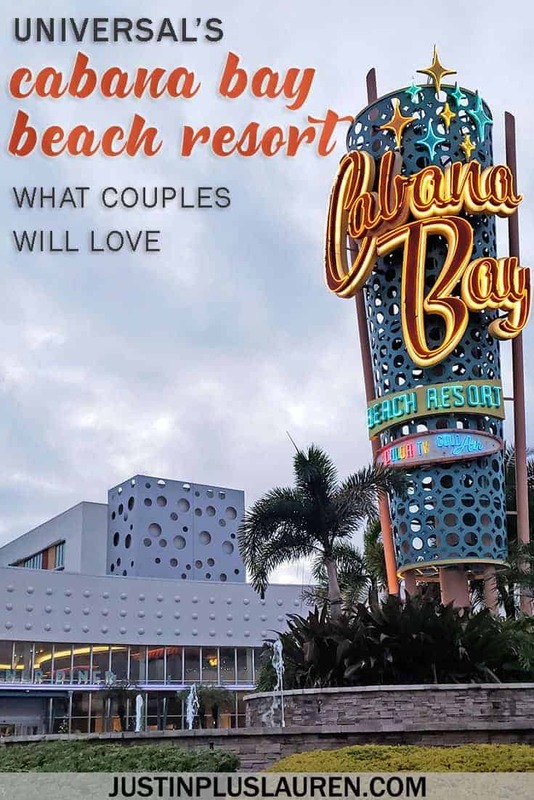 What makes this resort extra special for couples who travel? There are tons of awesome features for families, but don’t let that deter you if you don’t have children. 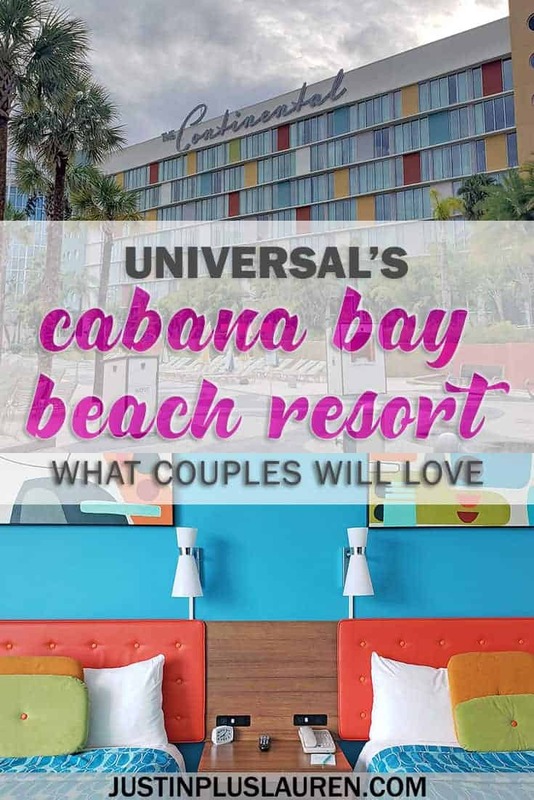 Here’s how you can enjoy Universal’s Cabana Bay Beach Resort with your partner. Let’s start with the obvious: it’s all about the retro style! 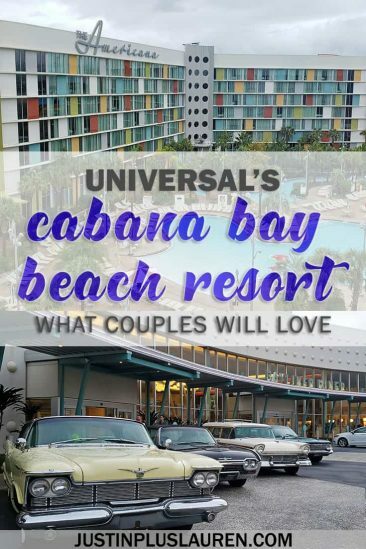 I’m sure that if you’re reading lots of Cabana Bay Beach Resort reviews, you’ll hear all about the style. What’s not to love? It’s just oozing with vintage flair down to every last detail, from the flashy exterior to your room’s toiletries. The hotel’s design showcases colors, patterns and styles from the 1950s and 1960s, transporting you back in time. 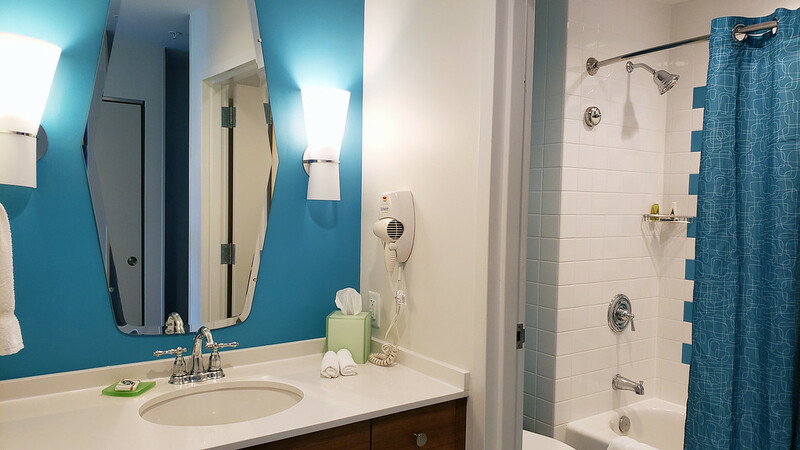 All the while, you’re enjoying modern amenities like complimentary Wi-Fi throughout the resort and your room. 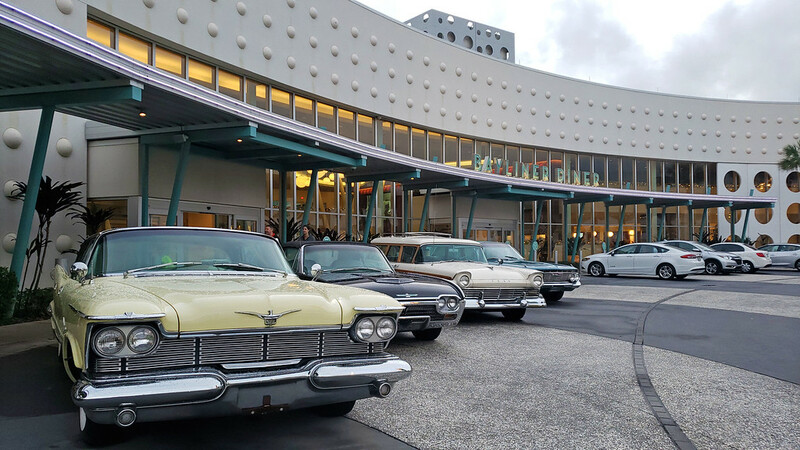 Outside the front lobby, there’s a huge neon sign and rows of classic cars. The building’s architecture reminds me of the art deco and mid-century buildings in Miami, but on a more massive scale. Geometric motifs flank the sides of buildings in lime green and maroon. Chunky squares of mustard yellow and rusty orange cover sections of the windows on the Americana and Continental towers. It’s pretty easy to fall in love with the design. 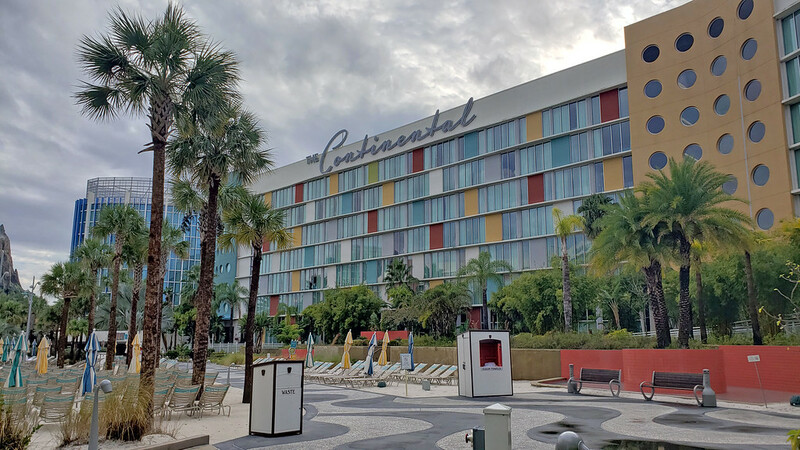 Justin and I really loved wandering around and exploring the various rooms and areas of Universal’s Cabana Bay Beach Resort. It was an exciting experience to walk around the hotel itself. 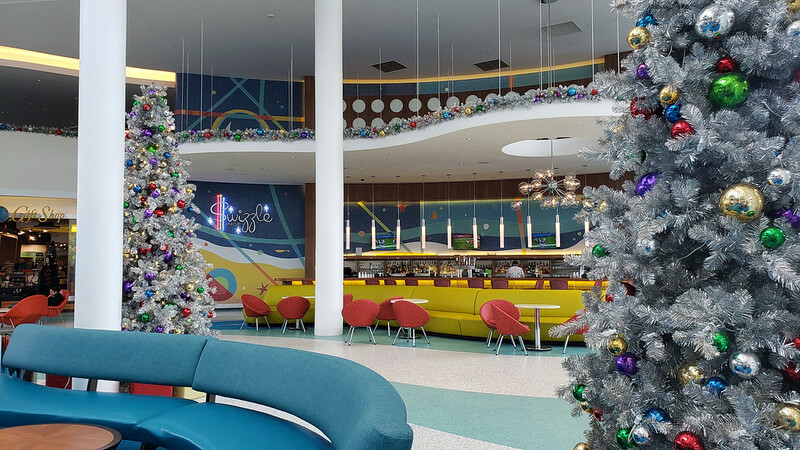 There were always new discoveries and details around every corner, like the vintage cartoons being played on the big screen as we dined in the cafeteria seating at the Bayliner Diner. Most entrances are decked out with flashy, neon signs, like at Galaxy Bowl and Game-O-Rama. 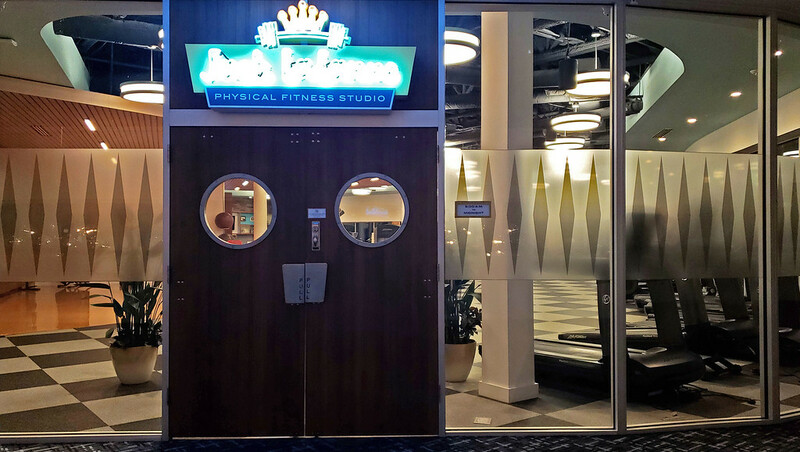 There isn’t an plain old gym at Universal’s Cabana Bay Beach Resort; it’s the Jack LaLanne Physical Fitness Center. Naturally, the Bayliner Diner, the main choice for dining at the hotel, has a 1950s style motif worked into the decor. 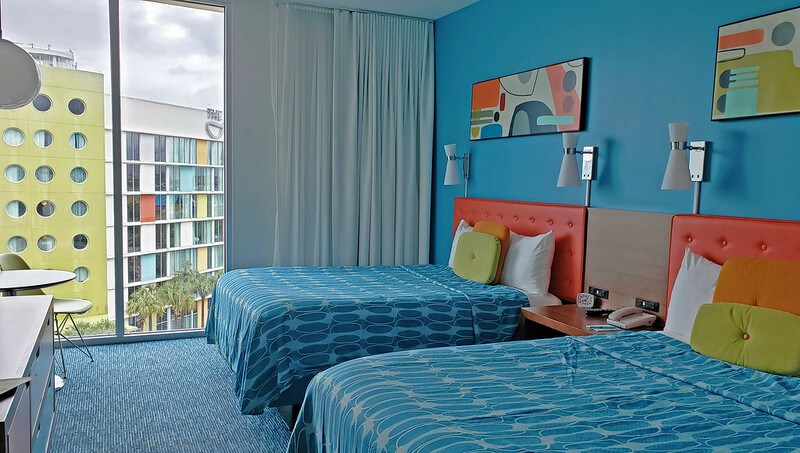 Universal’s Cabana Bay Resort rooms are bright, fun, and whimsical. 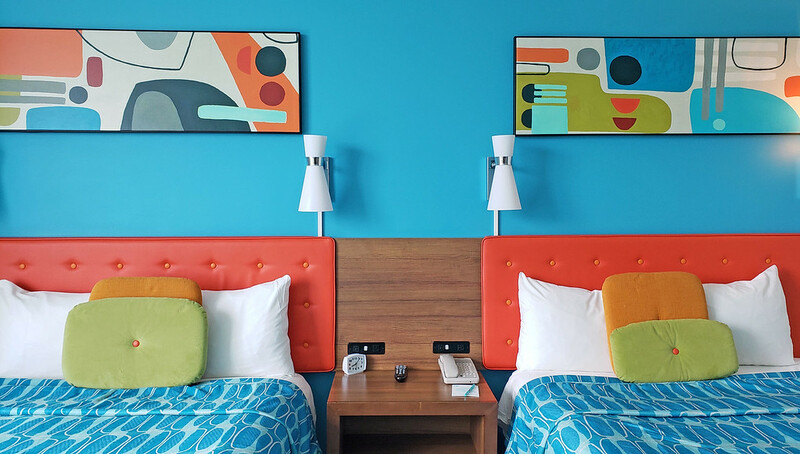 The retro patterns continue into the rooms in blue, lime green, and orange geometric shapes. Even the toiletries are throwbacks in their branding and packaging, with vintage V05 and Zest products. From the room to the view out the window, we felt like we took a time machine back to the 50s or 60s, which was a magical experience. Justin and I are both pretty competitive and love playing games. Beyond going to the theme parks, there’s entertainment right within the hotel itself. 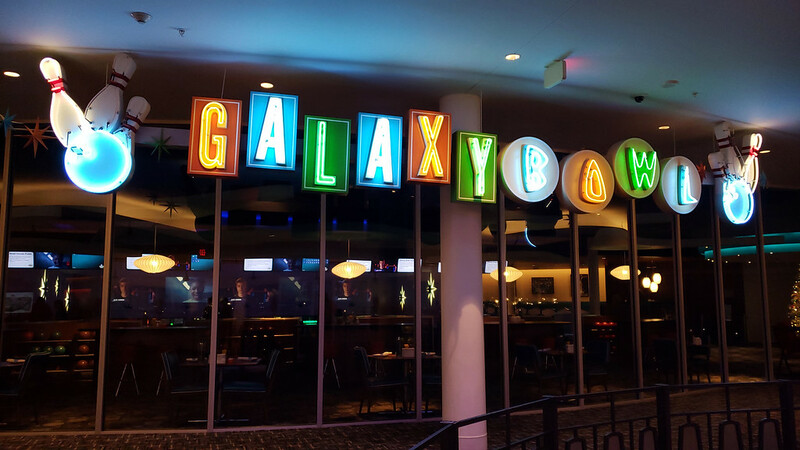 Universal’s Cabana Bay Beach Resort has its own 10-pin bowling alley called Galaxy Bowl, with 10 lanes decked out in neon lights. 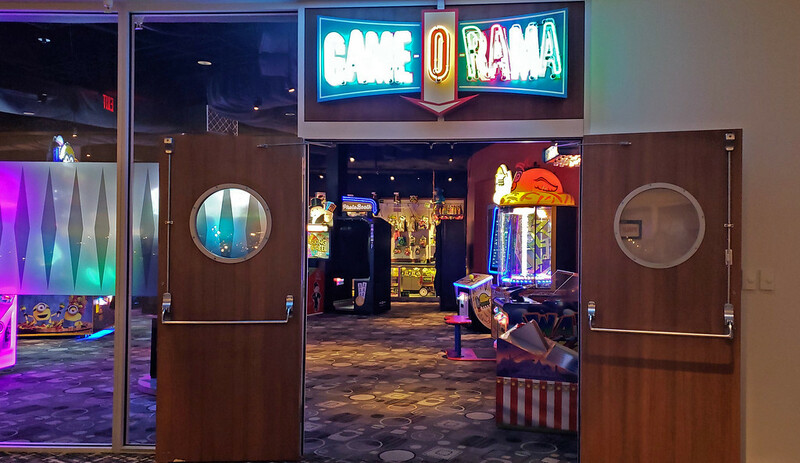 Right next door, you’ll find the Game-O-Rama with tons of arcade games, including one of our personal favorites, Skee Ball. After exploring the parks by day, it’s a fun idea to have a date night right at the hotel by challenging each other to bowling or video games. Game-O-Rama is open until 11:00pm and Galaxy Bowl is open until midnight. Universal’s Cabana Bay Beach Resort has arguably the best grounds out of any Universal Orlando hotel. There are two swimming pools just outside of your room. The Cabana Courtyard and Pool has a poolside bar, a water slide that’s themed like a dive tower, cabanas for rent, a fire pit, and picnic tables. If you choose to rent a cabana, you’ll have your own TV, lounge chairs, fridge with water, a safe, and even a phone number to order pizza. Nothing says romance quite like a private cabana with pizza! There’s a second pool that’s attached to a lazy river. Float around the lazy river in a tube (available for purchase on site, or bring your own ahead of time), and put your footprints in the sand at a small, sandy beach. There are two more fire pits here, as well as tons of loungers to soak up the Florida sunshine. 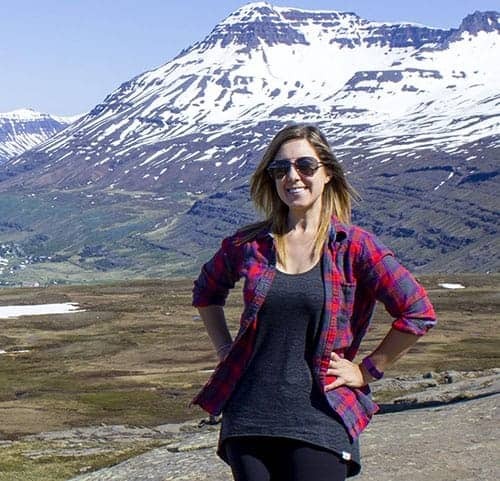 Unfortunately, when we visited in mid-December, Orlando was experiencing a cold snap. It was a little too chilly to swim or relax by the pool. 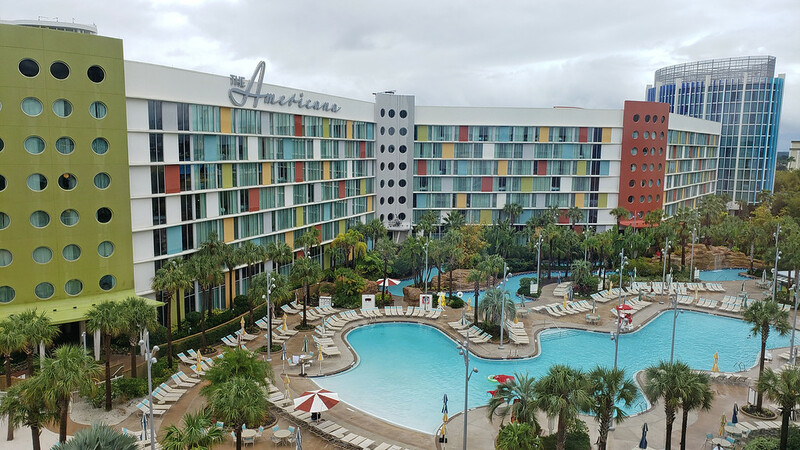 On our next trip to Universal Orlando, we’d love to make full use of the swimming pools and lazy river together. Who doesn’t love coffee? 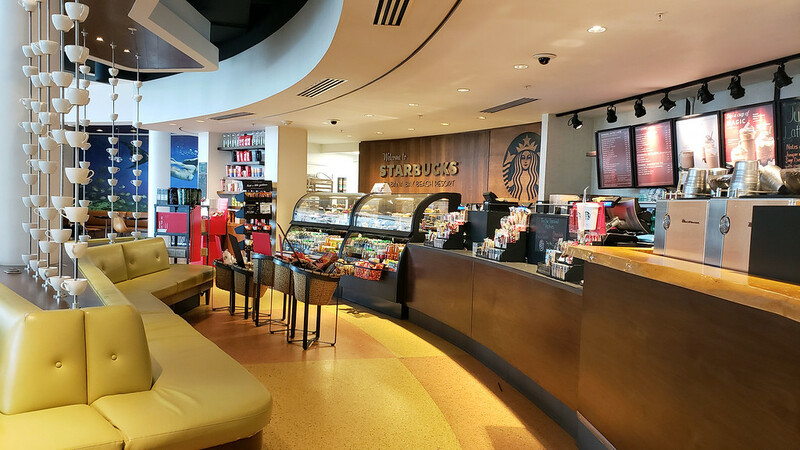 Well, even if you don’t like coffee, I’m sure you’ll find a beverage to enjoy at the Starbucks at the Cabana Bay Beach Resort. I loved that there was a Starbucks right near the front lobby. I could grab my morning caffeine fix there, as well as my post-dinner cuppa. Hey, what can I say? I love my coffee. You can order drinks and savor them in one of the many comfortable chairs at the Starbucks, or choose to the drinks back to your room. Universal’s Cabana Bay Beach Resort is one of the most economical hotel choices at Universal Orlando. 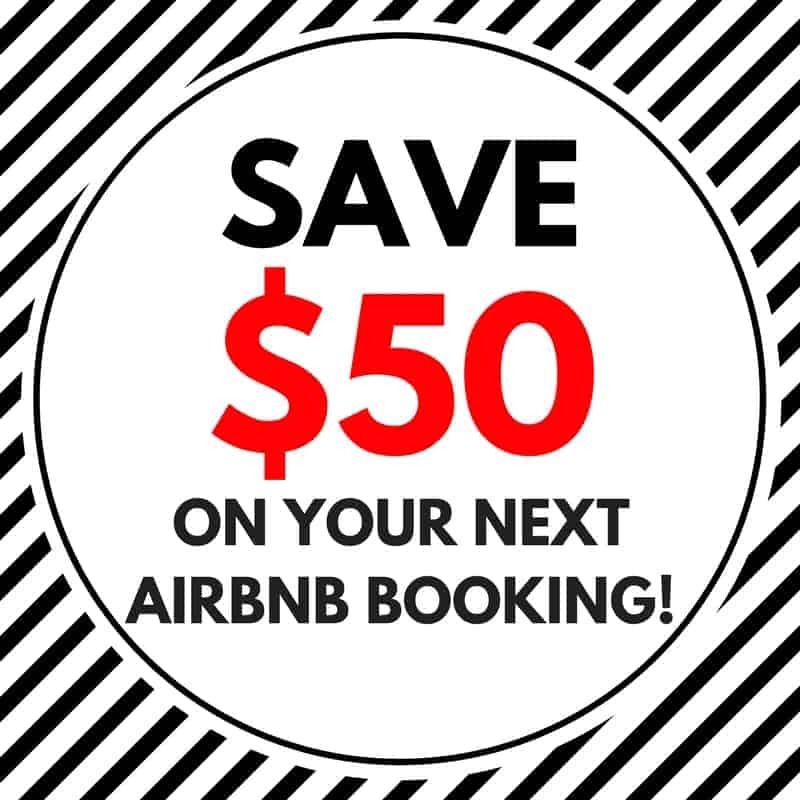 You can book your stay at the hotel without breaking your budget. The resort has both affordability and fun in mind. 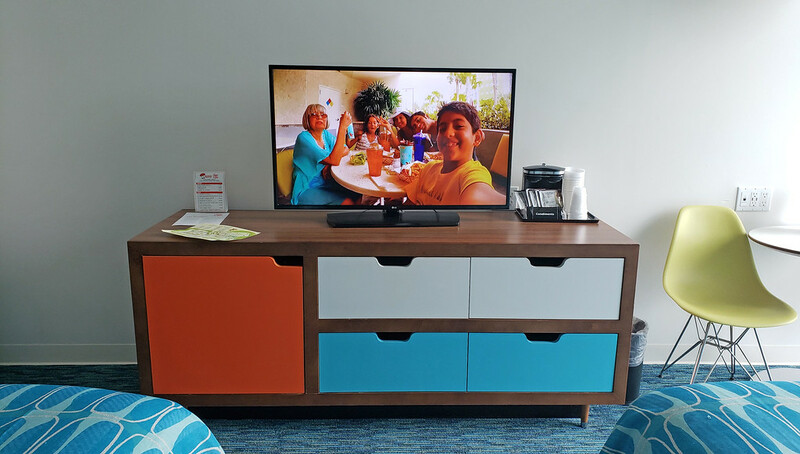 Standard rooms start at $120/night (family suites that sleep up to 6 people start at $160/night), making them an excellent choice if you’re sticking to a budget while staying right on the Universal property. 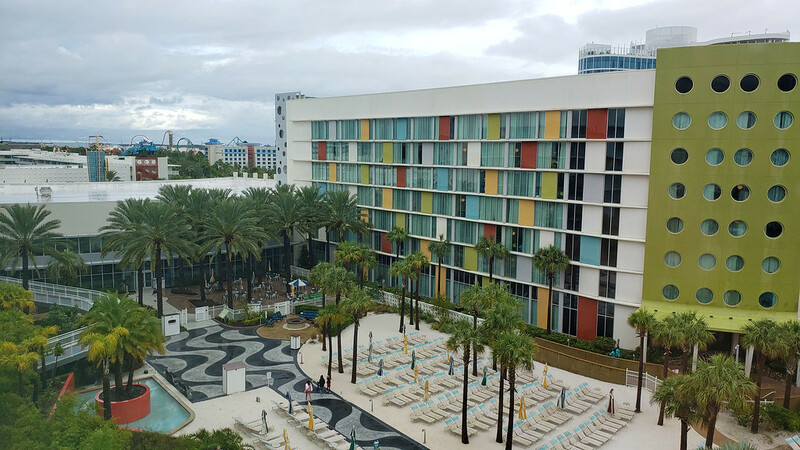 It’s incredibly convenient to stay at Universal’s Cabana Bay Beach Resort. There’s a shuttle that takes you directly to Universal’s Citywalk and the theme parks. However, you can also walk to the theme parks – it takes about 15-20 minutes. Justin and I chose to walk every time for some extra exercise, and to simply chat and enjoy the fresh air. You’ll also have early admission access to the parks if you stay at any Universal hotel, one hour earlier than general admission. There’s also amazing food over at CityWalk. You can check out everything we ate in our vegan guide to Universal Orlando. 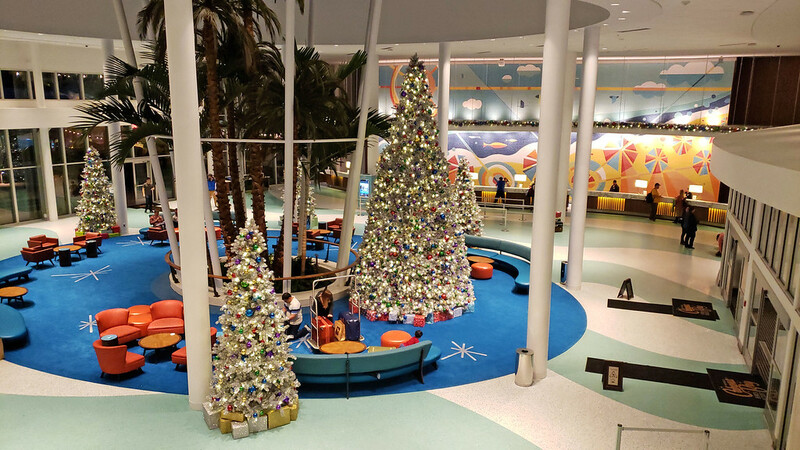 However, if you stay at one of the Premier resorts (Loews Portofino Bay Hotel, Hard Rock Hotel, or Loews Royal Pacific Hotel), you’ll receive complimentary skip-the-line express passes for Universal Studios Florida and Universal’s Islands of Adventure. If you’re thinking about purchasing the express passes, it might be worthwhile to stay at one of those hotels instead. 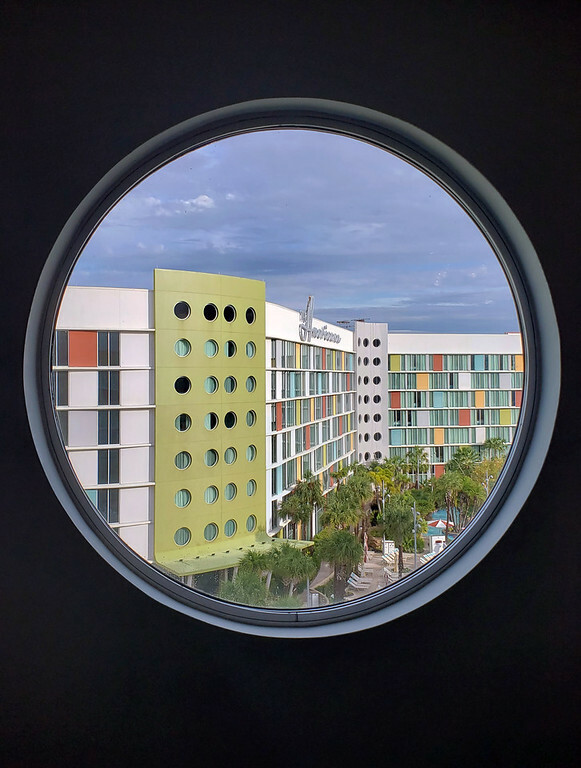 We thoroughly enjoyed our stay at Universal’s Cabana Bay Beach Resort and wouldn’t hesitate to book this hotel again. It was playful, fun, and even glamorous. Justin and I had such a wonderful time here and can’t wait to return. We received a discount off our hotel stay, but this didn’t influence our review in any way. PIN one of the above images to Pinterest by clicking the top left corner of each picture. What do you love most about Universal’s Cabana Bay Beach Resort?